Chili is an ultimate comfort food. I turn to it in late winter because it’s warming, simple and healthy. What I don’t love about chili is that it takes a long time to cook. Good chili simmers on the stovetop for hours. It’s worth it, but I don’t usually have the time. I came up with this quick chili recipe because I wanted all the comfort of homemade chili without having to wait all day. The secret to this recipe is a simple jar of salsa. You can use hot or mild, whatever you want. When you add a jar of salsa to a mixture of diced tomatoes, kidney beans, chili powder and seasonings something magical happens. All the slow-simmered flavors in the salsa fuse with the other ingredients and make it seem like the whole pot’s been simmering all day. While the diced tomato and salsa mixture is heating, you’re cooking some ground beef or ground chicken, making sure to crumble it well as it cooks. Add the meat to the tomatoes and you’re done. 14 minutes, start to finish. 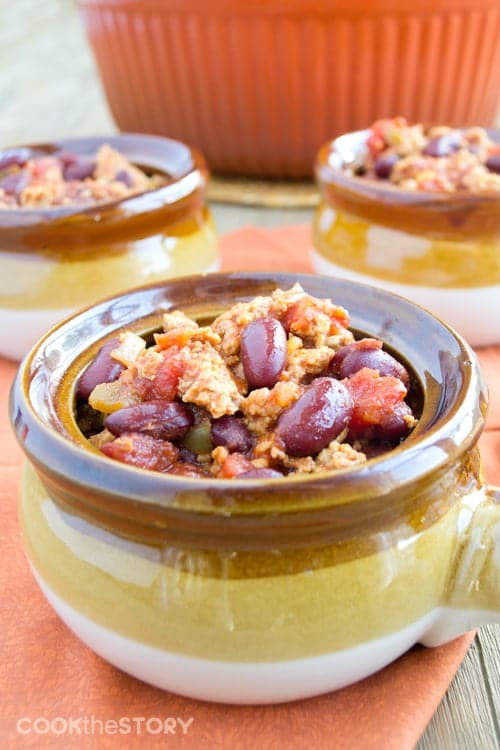 Now for the best chili recipe you’ll ever eat! Add the ground meat, garlic powder, 1 tablespoon of the chili powder and the salt. Stir often to crumble up the meat until cooked through, 5-7 minutes. 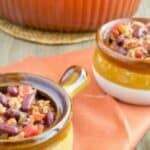 While the meat cooks, combine the remaining 1 tablespoon of chili powder, the salsa, diced tomatoes and kidney beans in a Dutch oven or soup pot set on the stove over medium-high heat. Cover. Cook, stirring occasionally, until heated through and bubbling, 6-8 minutes. Add the cooked crumbled meat to the tomatoes. Stir. Serve. This post originally appeared in January, 2014. It was revised and republished in January, 2019.